A web page of the federal german ministry for Environment, Climate and Energy in Baden-Wurttemberg informs companies about energy efficiency. Sankey diagrams are described as a useful instrument to detect hotspots for improvement and a tool in the framework of energy efficiency analysis. As a followup to last week’s post on a Sankey diagram from the GEA report. here is another one from the very same report (GEA, 2012: Global Energy Assessment – Toward a Sustainable Future, Cambridge University Press, Cambridge UK and New York, NY, USA and the International Institute for Applied Systems Analysis, Laxenburg, Austria). This one is an example for losses along the energy supply chain. The Sankey diagram shows the primary energy as 100% on the left and branches out the losses at each conversion/transmission step. The actual useful energy (the “energy service” of providing illumination) is only 1%. 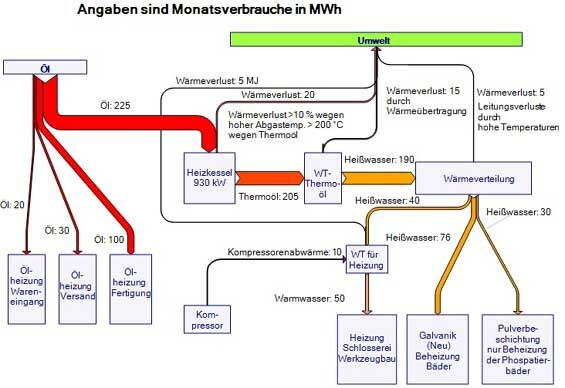 So in this example one unit of energy service requires 100 units of primary energy, clearly pointing to “abundant opportunities for improving efficiency exist at every link in the energy chain” (p. 116). I have presented a similar Sankey diagram here before, see this 2007 post ‘What it takes to power a bulb’. 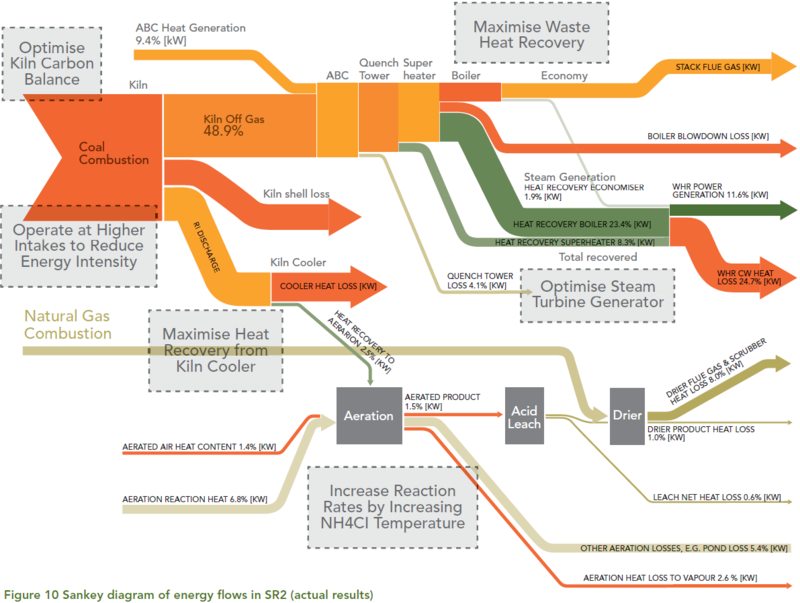 From a collection of case studies on Energy Efficiency found on the website of the Australian Department of Resources, Energy and Tourism (RET) comes the following Sankey diagram. This is from a synthetic rutile plant of Iluka Resources Ltd. in Western Australia. Iluka used the output from the energy and mass flows model to generate a Sankey diagram to represent the results in a visually effective and concise manner. 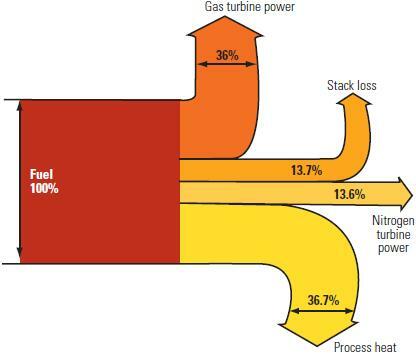 The Sankey diagram illustrates where energy is supplied to the process, how it is transformed and where it leaves the process. … The width of the arrows is in proportion to the amount of energy associated with each part of the process. 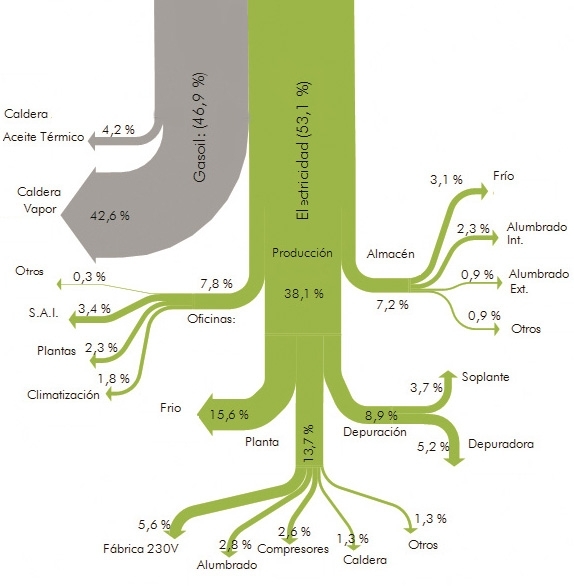 The Sankey diagram is an effective and intuitive way to communicate the energy flows at the plant. The diagram was used extensively during Iluka’s opportunity workshops. The diagram assisted the staff at the workshop to focus their attention on where the largest energy flows exist and identify where the main areas for improvement lie. Flows are in percent of the energy input. Possible improvement measures are given in the grey boxes. Full case study here (PDF). 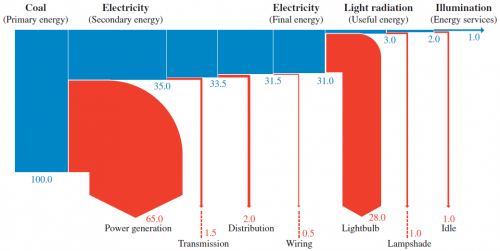 This simple energy consumption diagram shows a breakdown of electric energy in a company. 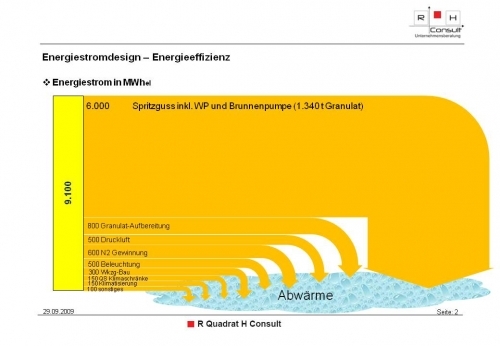 It is shown – along with a second Sankey diagram – on the website of German consulting firm RQH consult. This post on the Power Industry News blog features a Sankey diagram “for a dual Brayton cycle regasifier plant [that] shows how the fuel is consumed”. The article describes possibilities of improving the energy efficiency of the liquefied natural gas (LNG) reevaporation process. 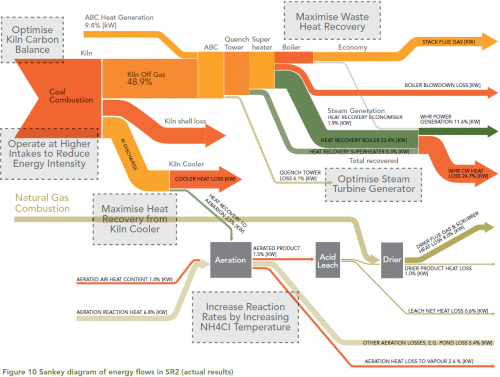 I quite liked the Sankey diagram for its simplicity, being to scale and color coding. The fact that the arrows for “process heat” and “stack loss” branch out in a slightly curvy way larger than 90° is uncommon, but hey, it gives the whole thing a special touch.